PAL Keylogger will secretly record EVERY keystroke on any computer including passwords and will record websites visited. All this discreetly and will silently email all the logs to you!KeyLog Pro is without a doubt the best spy software system in the market (according to Eye Spy Magazine). It is an easy way for monitoring a home computer. If you need to know the Internet activities of your child or spouse, this is the product we recommend. ...... All web addresses will be recorded, even if the web site cache is deleted. Need to find out your or someone's password? Key Log Pro will record all of them as well. All passwords will be recorded in the software's keystroke reports. This spying software tool can even email you detailed activity reports if you are ever away, at work or abroad. Key Log is amazingly simple and user-friendly. After clicking the link to buy the software, you will be able to install and use the software within minutes! Qweas is providing links to PAL Keylogger Pro 8.0 as a courtesy, and makes no representations regarding PAL Keylogger Pro or any other applications or any information related thereto. Any questions, complaints or claims regarding this application PAL Keylogger Pro 8.0 must be directed to the appropriate software vendor. 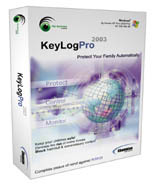 You may click the publisher link of PAL Keylogger Pro on the top of this page to get more details about the vendor.